How to calculate the driving cost? You know this all too well: never-ending traffic jams, constant honking, and moving forward at a glacial pace as you try to make your way to work every morning. Or maybe you're one of these lucky fellows who take the motorway and arrive in the office in under half an hour? Regardless of whether you love or hate your daily commute, this commute calculator will surely come in handy, giving you a clear picture of how much you spend on your back-and-forth travels every month. It will also compare the commute cost to what you'd pay if you used public transportation. Maybe you opt for a commute by bike? Check how much you save on two wheels! Unless you already pedal through the city each morning, it's highly probable that you choose the most obvious mode of transportation - your car. In the US, over 85% of all workers commute by car, and only 10% of them decide to use carpooling to lower the costs of driving. Days is the number of days on which you commute every month. 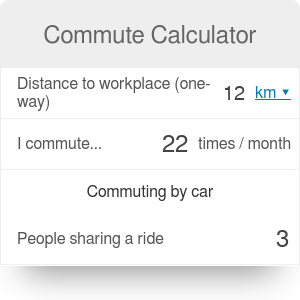 Our commute calculator uses a default value of 22 days, but you can adjust it to your working habits. Distance is the distance to your workplace (one-way). MPG is the fuel consumption of your car. You can input it in miles per gallon or liters per kilometer, whichever you prefer. Remember that the MPG in dense urban traffic is lower than if you'd driven 500 miles along a motorway! Fuel price is simply how much you pay for one gallon of gas. Parking and toll are the monthly costs of parking your car, using the motorways or bridges, and all other small payments you need to cover. Wear and tear are the costs of maintenance, changing the tires, and the costs associated with the car value depreciation. All of these parameters allow you to calculate the total commute cost. Naturally, you can find yourself spending a bit more or less (depending on the traffic or the condition of your car), but the result is a reasonable estimate of how much you spend every month just to get to your workplace. In the previous section, we assumed that - just like most of the US commuters - you drive to your office on your own. But what if you tried carpooling? You could, for example, leave your house ten minutes earlier to give your colleague a lift, or help your neighbor get to the city center every morning. Carpooling has a few benefits, the most tangible of which is, naturally, lowering the driving costs. Try to change the number of people sharing a ride in this commute calculator and see how drastically the costs per person drop. The drive time will probably increase by a few minutes, but it is usually worth the effort. Saving money is not the only advantage of carpooling. By using the full seating capacity of your car, you minimize the negative impact on our environment. Car pooling decreases the number of vehicles on the streets, what leads directly to lowered carbon emissions or smaller traffic jams. Our commute calculator can also determine the cost of traveling by public transport, be it subway, a bus, or a train. All you need to do is input the price and validity period of the ticket you normally use. If you're not sure which option to choose, head straight to our ticket optimizer to pick the most cost-efficient option. Once you've input all necessary information, the commute cost calculator compares the cost of public transport with your car commute. Quite often, public transportation will actually be cheaper than driving - unless, of course, you're sharing your journey with coworkers! Commute Calculator can be embedded on your website to enrich the content you wrote and make it easier for your visitors to understand your message.